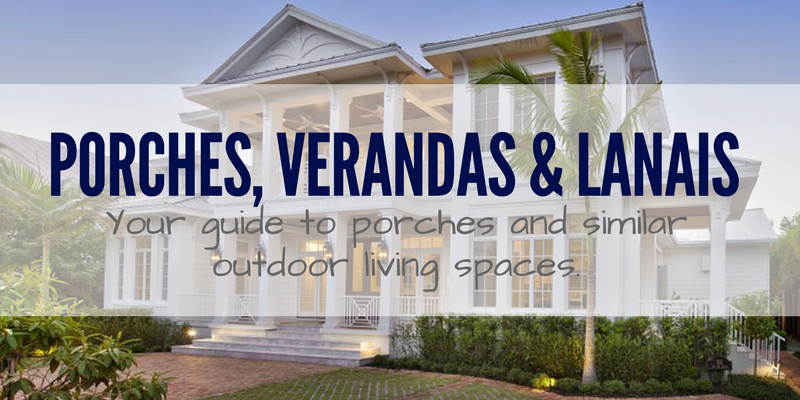 Home / Blog / Learning Resources / Porches, Verandas and Lanais – Oh My! Since we design custom homes for and sell stock house plans to clients all over the world, we thought it would be helpful to clarify porch nomenclature, which by the way, depends greatly on geographical location. We’ll start with the most popular and generic term. The word porch refers to a covered outdoor space attached to a home. It can be located on the front, side or rear of a home or wrap around it. A porch can have a concrete slab or a wood plank foundation, and be screened in or open. The size of a porch will typically at least accommodate a few chairs or may be quite expansive with enough room for multiple furniture arrangements, fireplaces, outdoor kitchen and bar. The word veranda can be used interchangeably with porch. A wrap-around porch with railings, on the first floor is commonly called a veranda in the South. The word lanai originated in Hawaii, and is now used in many tropical areas including Florida to describe a rear porch. 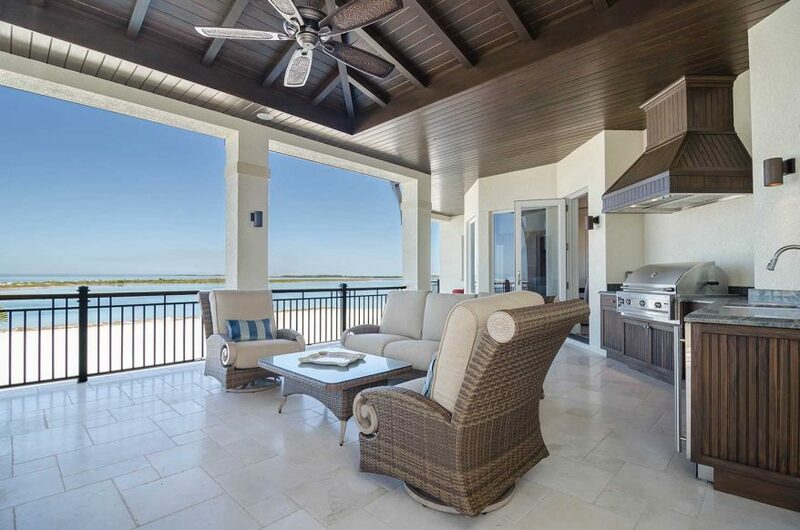 A lanai can span the entire rear of a home and be simple or very elaborate with ornate ceilings, multiple furniture arrangements and amenities such as fireplaces, outdoor kitchen and bar. The foundation of a lanai is typically made of concrete, stone or pavers. Loggia is a word of Italian origin that refers to a shallow open covered porch with arched openings or columns. In Mediterranean style architecture, loggia is often used interchangeably with a small rear lanai or front porch that has arched openings or columns. A portico is a covered front entry supported by columns. It can be very simple and utilitarian, or a luxurious element of a grand entry system for human traffic. A portico should not be be confused with a porte-cochere, described below. A porte-cochere is a covered structure at a primary or secondary entrance of a building through which a vehicle can pass providing shelter arriving and departing occupants from the elements. Patio is a word of Spanish origin that describes an uncovered concrete, stone, brick or paver outdoor area for entertaining. 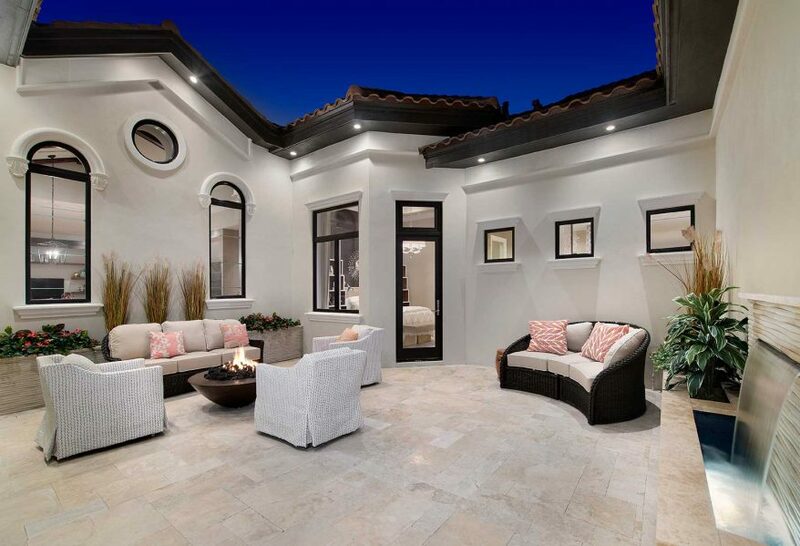 A patio may be an extension of the home or be situated in a courtyard. An outdoor balcony is a covered or uncovered platform that extends from a home at the second floor or higher and has railings. A large balcony or terrace that is situated over the top of a first floor covered porch or lanai may sometimes be called a lanai if covered or a sundeck if uncovered. A deck is an uncovered outdoor sunning area with wood plank or concrete foundation. It may also be an uncovered extension of a covered lanai or porch and surround a pool. Like a balcony, a terrace is an uncovered platform with railings extending from a home on the second floor or higher, however a key difference is size. A terrace is larger than a balcony offering room for furniture arrangements, and is usually uncovered. Whatever you decide to call it, the porch or lanai has become an essential part of most home designs. Homeowners are prioritizing outdoor living space more than ever and incorporating it as a central gathering spot in the home.